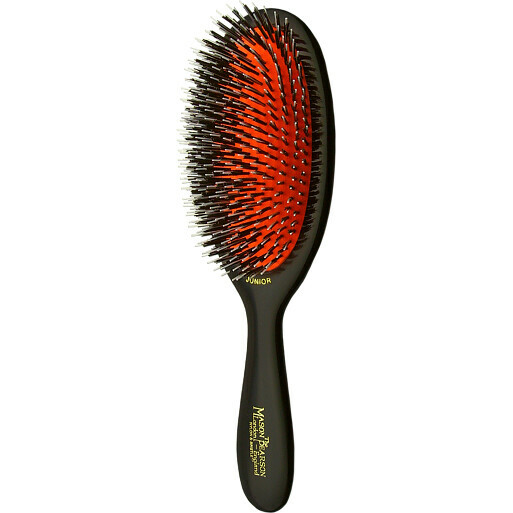 This boar bristle and nylon mix brush is best for normal to thick hair, with 7 rings of pure bristle and nylon tufts to stimulate blood flow to the hair roots. The density of the bristles allows conditioning sebum to be more evenly distributed from the roots to the ends of the hair. Mason Pearson Brushes Bristle/Nylon Junior is rated 5.0 out of 5 by 9. Rated 5 out of 5 by Charmine from Pricey but worth every penny Mason Pearson has proved its quality worth the high price it gets. My hair is easy to get messed and fall down. But after using MP brushes, it's getting better by the time. I used BN2 for my shoulder length hair but will purchase BN1 for longer hair. Rated 5 out of 5 by Emmieb from ditch the conditioner I treated myself to this brush as I currently own a cheap bristle brush. I did wonder if it was worth the money and whether people just wrote good reviews because they had spent so much on a brush! But it's totally true. Fantastic brush - I have a lot of very fine hair - it looks thick but the strands are quite fine. This gets through down to the scalp - gently. I have started using no shampoo and just bar hair soap with no chemicals and this conditions my hair beautifully - redistributes all the natural oils and it's a genuine pleasure to brush my hair. Even better if you have someone else to do it too! it's also the perfect size for my shoulder length hair. It's an investment but I think you will save long term as you will need fewer products for your hair! Rated 5 out of 5 by Winniethewitch from Fabulous! Having lusted after a Mason Pearson brush for years, I thought I'd take the plunge when I saw the great price on this website. So glad I did! And the service and delivery was brilliant too. Rated 5 out of 5 by AngelinaN from Best Travel Brush I love the mixture of this brush since in a travel size it needs to get through my long hair. I take this when I go on vacation since I don't want to carry my bigger all bristle brush.